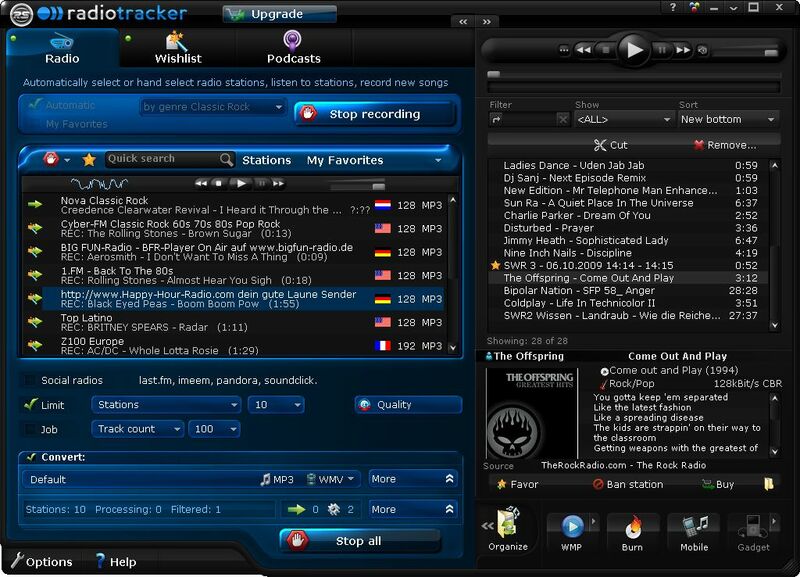 Radiotracker Free is your access to free radio music & entertainment! Listen to more than 60,000 webradio stations of the world. Find stations by name, genre, country, and quality, or even by frequently played artists. Managing your favorite stations is super easy. Subscribe and enjoy podcasts and convert podcast episodes automatically to any file format. Burn CDs, create ringtones, sync files to mobile media player. ...... and online shops alike. Radiotracker is the most powerful webradio player that is available. Radiotracker Free's database contains more than 60,000 webradio stations, all major stations of the world are included, and all major streaming formats are supported. You get powerful tools to browse and find your favorite stations: Search by station name, browse by music genre, browse by country or restrict by quality (bitrate). It is even possible to locate radio stations based on frequently played artists. Every station can be played immediately. Organize your favored stations in several favorite lists, so that you can play your station by one click. Switch between favorite lists with ease. Additionally, you will be supplied with one of the most complete podcast databases containing tens of thousands of the best podcasts of the world. Easily find them, subscribe to them, download their episodes, and enjoy them. Qweas is providing links to Radiotracker Free 9 as a courtesy, and makes no representations regarding Radiotracker Free or any other applications or any information related thereto. Any questions, complaints or claims regarding this application Radiotracker Free 9 must be directed to the appropriate software vendor. You may click the publisher link of Radiotracker Free on the top of this page to get more details about the vendor.